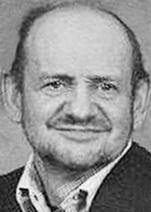 WATERLOO - Roger R. Bellows, 69, of LaPorte City Nursing and Rehab Center, formerly of Waterloo, died Wednesday, Dec. 31, 2008, at La Porte City Nursing & Rehab. He was born May 3, 1939, in Sundance, Wyo., son of Raymond and Mary Schlitzkus Bellows. Mr. Bellows farmed with his father near Cresco, and he had worked for Powers Mfg. Co. and OMJC Traffic Signal Salvage. Survived by two sisters, Mary A. (Robert) Allen of Princeton, Ill., and Nettie Mae (Paul) Carrier of Genoe, Ill.; and three brothers, William F. (Yvonne) and Beau J. (Ramona), both of Waterloo, and Harold K. of Walnut Creek, Calif.
Family graveside services will take place at Pine Grove Cemetery near Moorcroft, Wyo., following cremation. There will be no visitation. Locke Funeral Home is in charge of arrangements.